Using turmeric for healing various diseases and conditions goes back thousands of years and it is an important feature of Ayurvedic medicine. However, using turmeric for fibroids is only a recent development but you need to jump on this immediately since turmeric has such amazing healing properties. The many health benefits of turmeric are nothing new. It is simply that science is just now catching up to the age-old secrets of turmeric but research into turmeric is still not that extensive. Turmeric is an amazing spice that is native to India and is a common feature of Indian cuisine (curries). Spices usually come from the bark, fruits, roots, seeds or buds of a plant. In this case, turmeric is derived from the rhizomes (underground stems) and roots of the Zingiberaceae tree that is native to India and is part of the ginger family. 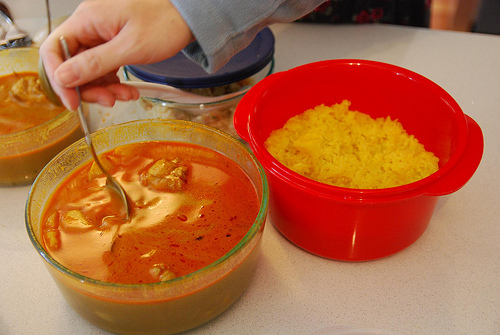 Turmeric is the spice that is included in curry in order to make it yellow and is also a part of yellow mustard. The age old secrets to amazing turmeric is the active ingredient that it contains which is known as curcumin and has been noted to have very powerful antioxidant and anti-inflammatory properties. If you also deal with any of the above conditions in addition to fibroids, turmeric can actually help you “kill two birds with one stone” so to speak. One of the important features of turmeric is its work on the liver as discussed above that it can help to treat and prevent liver damage. A properly functioning liver is important for natural fibroid treatment. Why? Because the liver is an important organ that helps eliminate waste and toxins from the body. It is also important for removing excessive estrogen from the body. Excessive estrogen leads to a state of estrogen dominance which has been blamed not only for the development of uterine fibroids but also for the increase in size of the tumors as well as the development of various symptoms of uterine fibroids. Learning to manage your hormone levels in order to prevent estrogen dominance is an important aspect of naturally shrinking fibroids as well as preventing them in the first place. This is why the liver is so important and why turmeric is so important. In addition to preventing liver damage from various factors such as toxins in the body, it also stimulates the liver so that it performs at its fullest potential causing it to remove toxins, waste and excessive estrogen which can help to promote hormone balance and help to shrink fibroids and reduce the various symptoms of uterine fibroids. Turmeric for fibroids is also to be considered because turmeric stimulates the immune system which helps the immune system better fight against various diseases and conditions including uterine fibroids. This spice is also anti-inflammatory which can help to heal your body of fibroids as well as prevent their return in addition to helping alleviate pelvic pain and pressure which may be associated with fibroids. You can add this spice to food and drink on a daily basis. You can add it to milk, to cereal, to coffee or any other way in which you ingest it. If you decide to drink it though, do remember to use a straw in order to avoid the yellow stains to your teeth and use 1 teaspoon of the powder per cup and make sure that you drink at least three cups a day. BUT: The powdered turmeric found in most grocery stores that most people use does not contain adequate amounts of curcumin when you drink or use the powder in food. 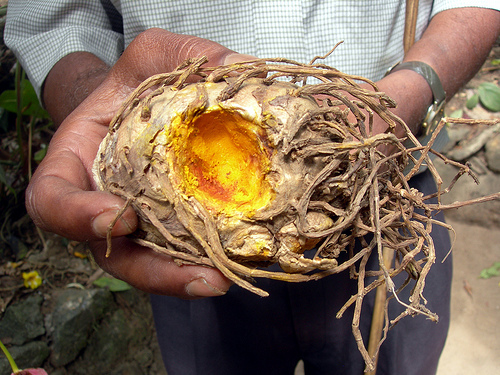 This turmeric typically only contains about 3 percent of curcumin which is inadequate for natural treatment purposes. You would need six to eight teaspoons of this store-bought turmeric per day in order to compare to what you would get in 1 to 3 turmeric capsules. This will be hard to accomplish as you would need at least three meals a day that call for significant amounts of turmeric and who’s got time for that! Drinking it is also not as pleasant and can really stain your teeth. This makes obtaining the benefits of this key ingredient from capsules much better and easier. But if you do take it this way by using the store-bought turmeric, make sure that you add black pepper in order to increase the absorption of turmeric by the body because turmeric can be difficult to be absorbed into the body. Black pepper is rich in piperine which makes curcumin more bioavailable to the cells as shown in various studies. Without adding black pepper, the body will metabolize this herb quickly and you will not enjoy many of the health benefits of this spice. Adding black pepper will significantly improve the body’s ability to use it. Taking turmeric in pill or capsule form may be the best way as it is less messy and very convenient. Turmeric will also stain everything and it may take several washes to rid yourself of the stains which means that you may prefer using turmeric or curcumin capsules to avoid the stains from turmeric spice usage. Turmeric capsules have been found to be just as effective if not more so than the raw spice since they contain more concentrated amounts of curcumin which will enable turmeric to have a positive effect on your fibroid tumors. When using turmeric for uterine fibroids natural treatment, the commonly recommended dosage is about 1,200 milligrams a day made up of 400 milligrams of curcumin taken three times a day or you can follow the manufacturer’s guidelines on the label of the capsules you choose. Try these capsules. A turmeric tincture is another way for using turmeric for fibroid treatment and you would need about 1 teaspoon taken three times a day of the tincture. A tincture is an alcohol extract. The alcohol is used to extract the full benefits of the herb or spice and is also used as a preservative. If you want to avoid alcohol, you can remove it from the tincture using various methods you can find by searching online. It is also common to find tinctures that do not use alcohol to extract the properties of the herb or spice. For a bestselling turmeric tincture that you can use for fibroid natural treatment, click here. Tinctures are also preferred because while you can also take them orally, they can also be applied underneath the tongue which helps bypass the digestive tract and go straight to the bloodstream. Going through the digestive tract means that less curcumin will find its way to the bloodstream although you can still take it this way. You may experience an allergic reaction to turmeric that may result in a rash or liver enzyme elevation. If you take too much, you may deal with upset stomach, nausea, vomitting, dizziness, etc. Talk to your doctor first if you are using other medications as turmeric may react badly to the medications so examine any medication you are taking and talk to your doctor first. This spice may also increase the risk of developing kidney stones in some people because it increases oxalate in urine. Using turmeric for fibroids as an important step you should consider implementing in your natural fibroid treatment regimen because it is an amazing natural remedy that is also supported by scientific evidence. If you do not have a natural treatment regimen in place for fibroids yet, you may want to consider the Fibroids Miracle guide which will show you step by step how to eliminate all types of fibroids and their symptoms for good using natural methods only. You must definitely get curcumin for fibroids but it is only one key ingredient in beating fibroids naturally. The other key ingredients that you need will be found in this holistic fibroids treatment guide which costs less than what you spend a week on coffee, on lunch or dinner, on a manicure or pedicure, on a girls’ night out, etc, and none of these are as beneficial as this guide. Click here for more on this bestselling guide. Prev Green Tea And Fibroids and Why You Should Drink Up!